This press release came from our partners StudentsFirstNY. (New York, NY) – More than 200 students and parents joined leading education reform organization StudentsFirstNY on the steps of City Hall today to bring attention to a hidden tax that is costing New York City high school graduates an estimated $63 million annually. This “Remediation Tax” affects 21,000 New York City college students who have graduated from city high schools but are unprepared for college-level coursework. CUNY students are speaking out about how the Remediation Tax impacts their college experience and future opportunities. The $63 million Remediation Tax refers to the cost of remedial courses that college students are forced to take before they can enroll in classes that earn credit towards a degree. This undue burden is imposed disproportionately on low- and middle-income New Yorkers who attend K-12 schools that fail to provide their graduates with the skills and knowledge they need to succeed in college. While not unique to New York City, Mayor Bill de Blasio refuses to address the problem and his education policies threaten to exacerbate it. That’s why students and parents are demanding that the Mayor take action immediately to improve K-12 education in all neighborhoods, especially those in longtime struggling districts like Harlem, the South Bronx, Bedford-Stuyvesant and Jamaica, Queens. “The Remediation Tax cuts the knees out from under the City’s most vulnerable students just as they are making the leap to college forcing them to pick up the slack for a public school system that has failed them. 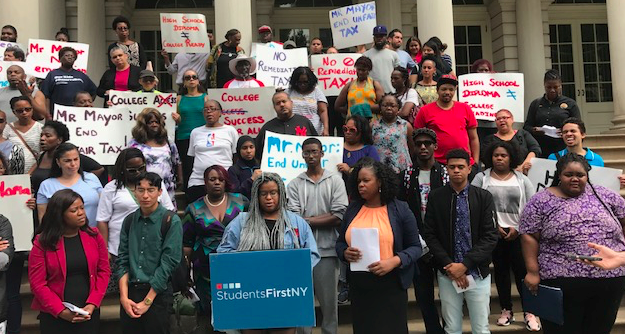 The most shameful aspect of the hidden Remediation Tax is that it impacts only the most committed students who are working hard and striving for a better life,” said StudentsFirstNY Organizing Manager Asia Thomas. “$63 million is a huge amount of money for working families in New York City. Mayor de Blasio must do more to help these 21,000 children get ready for college and end the Remediation Tax,” said StudentsFirstNY Director of Programs Renisha Ricks. “It’s crushing to find out that the high school diploma I worked so hard for is meaningless in college. I have to redo all this work again, wasting months and months of my life – not to mention I have to spend part my financial aid just to cover the extra cost of this Remediation Tax,” said BMCC freshman and Queens Vocational and Technical High School graduate Erick Mathus. “Most kids in the wealthiest neighborhoods don’t have to pay the Remediation Tax, because they go to schools with effective teachers who make sure they learn what they need to learn to prepare for college. It is time the Mayor did something about that immediately and take on this college readiness crisis,” said New York City College of Technology student and City Polytechnic High School graduate Cris Sackey. “I’m getting financial aid, but I know that won’t last forever. With all the remedial courses I have to take, I’m not earning any credit and I don’t know if I’ll have enough left to finish my degree,” said LaGuardia Community College Student and August Martin High School graduate Janai Huff. “The Remediation Tax is real, it’s regressive, and it’s being levied on the poorest New Yorkers. Once again, it’s poor kids who are forced to bear the burden of a system that is failing them. Unfortunately, Mayor de Blasio is not doing anything to help and is even making it worse,” said Executive Director of NYCAN Derrell Bradford. StudentsFirstNY organizers spent the summer canvassing City University of New York (CUNY) two and four-year college programs and surveyed over 300 students at 21 colleges who attended over 200 different NYC high schools to see how students feel about the Remediation Tax. A majority of student respondents felt their NYC public high school experience did not prepare them for college and a majority said they are taking remedial courses.